Grant and I recently took up golfing. I never thought this would be a sport I would get into. It seemed like such an uppity sport for people that were way to into themselves. Not to mention a "man's sport." When I was a teenager my Mom encouraged me to take up golf. It didn't sound like fun to me so I never tried it out. 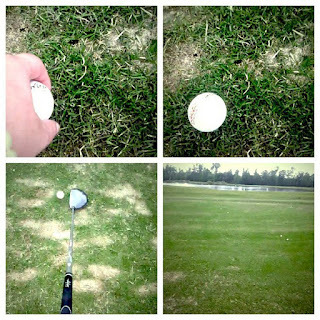 It wasn't until Grant and I went out to the driving range that I really understood why people golf. Hitting a ball as hard as you can with a stick is a fantastic feeling. Not to mention, there is a true science to golfing. It's the perfect sport for a nerd. I've never really been a fan of watching golf, now I occasionally turn on the Golf Channel. I'm completely obsessed! I've also discovered the world of golf fashion. LOVE IT! Yes, there are some extremely hideous golf outfits out there but there are also some really cute ones. If you follow me on Pinterest you probably already know this. Are you a golfer? Or is there a sport that you hated as a child but now love as an adult?